Rainbow Springs Lodge was built in the mid-1960s on an island formed by the spring branches of Rainbow Springs as it flows into the North Fork of the White River. 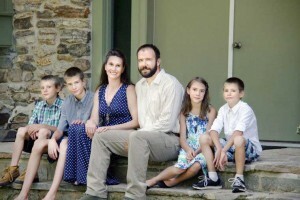 The lodge, which has four bedrooms and five bathrooms, is being managed and operated by the McKee family, owners of nearby River of Life Farm and Tree House Cabins. It’s fair to say the spectacular setting is one of the prettiest pieces of paradise the Missouri Ozarks has to offer. The spring, and thousands of wooded acres around it, has been privately owned and preserved by Carpenter’s St. Louis-based family for more than a century. Rainbow Springs is the best-kept secret among Missouri’s natural wonders, but that is about to change. 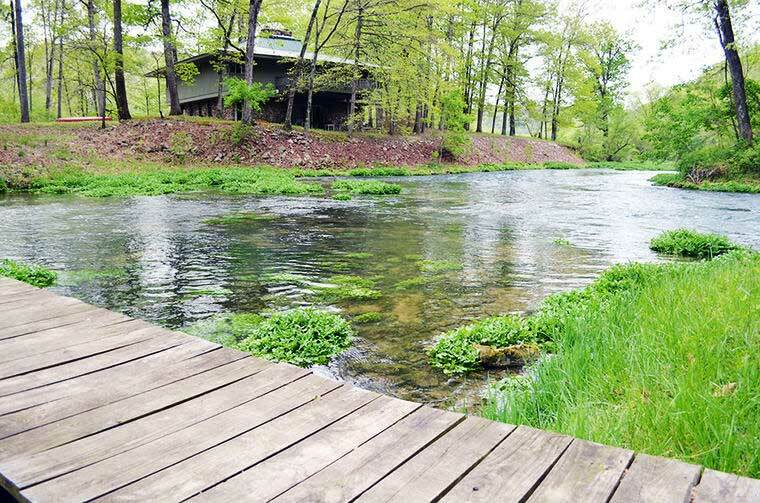 A historic fishing lodge overlooking the spring is now available for nightly rental. Rainbow Springs is the third largest in a state that boasts several impressive springs. The average daily flow is more than 100 million gallons of crystalline water that empties into the North Fork of the White River. Wet weather can increase the output to more than 180 million gallons. The water bursts from the base of a wooded bluff with a boil that rises one to two feet above the surface in a rocky grotto green with ferns, mosses and watercress. Rainbow Springs originally was called Double Spring because the water splits into two branches as it leaves the pool, entering the river at two spots about a mile apart. The rushing water doubles the flow of the North Fork, a pristine floating and trout fishing stream in south-central Missouri, some 25 miles from the Arkansas border. 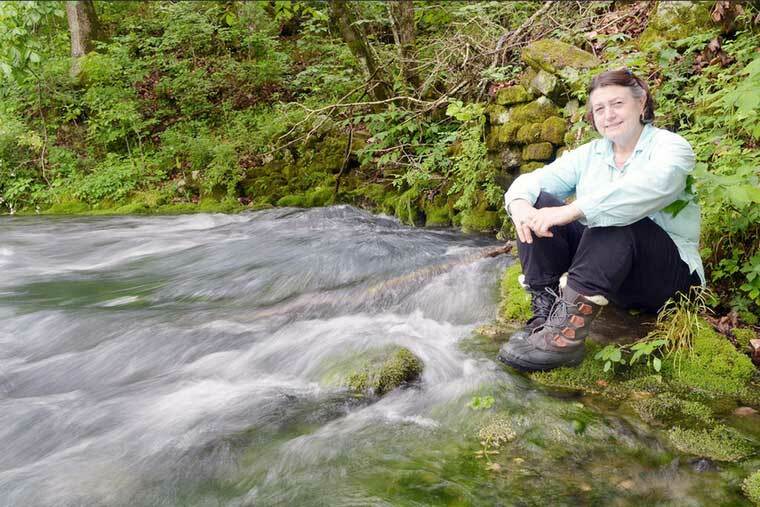 Dorothy Carpenter sits beside the privately owned Rainbow Springs near Dora, believed to be the third largest spring in Missouri. A strip of bottomland forest perhaps 100 yards wide sits between the spring and the river. The spring branches flow around the land on their way to the river, forming an island. The only structure on that island is Rainbow Springs Lodge, which was built in the mid-1960s. The lodge has four bedrooms and five bathrooms, and a distinct design with wide eaves on the roof and a stone-and-wood fireplace that soars through an atrium in the interior. Carpenter, who is 65 and without children, owns the lodge with her sister and a cousin. This May, they put it up for nightly rental through River of Life Farm, a resort a mile of so downriver. Myron and Ann McKee, owners of the popular resort, are known for their “treehouse” cabins, some by the water’s edge and others hidden higher up the hillside in the secluded river valley. One of the largest springs in Missouri, Rainbow Springs pumps 137,000,000 gallons per day into the White River and, aided by smaller springs along the way, provides optimal trout habitat. The spring, pictured to the right of the Nold family, the caretakers of the property, provides a peaceful backdrop for the privately owned rental, Rainbow Springs Lodge. The company stocked the spring with rainbow trout and changed its name from Double Spring to Rainbow Springs. Carpenter explained that in the early 1920s, people were seeking a summer escape from the soot and heat of St. Louis. Riverside clubhouse communities like Times Beach and Castlewood sprang up in St. Louis County. Rainbow Springs was on the drawing board. In 1928, her grandfather, Birch Oliver Mahaffey of St. Louis, discovered the project and bought a fifth of the company and some 6,000 acres surrounding the spring. Mahaffey had four daughters, and three of them hired Evans, the architect, to design a lodge for their families. The house was done in the mid-century modern style, with ingenious touches. The fireplace hearth is of poured and polished concrete wide enough to sit around. The chimney is fronted by slanting wood strips wide enough for storing fly-fishing rods. Mahaffey long had the idea of cooling the lodge with the 55-degree spring water, and Evans attempted to do it, with little success. Myron McKee of River of Life has preserved the lodge’s historic furniture and artifacts, although he did update the heating and cooling system. 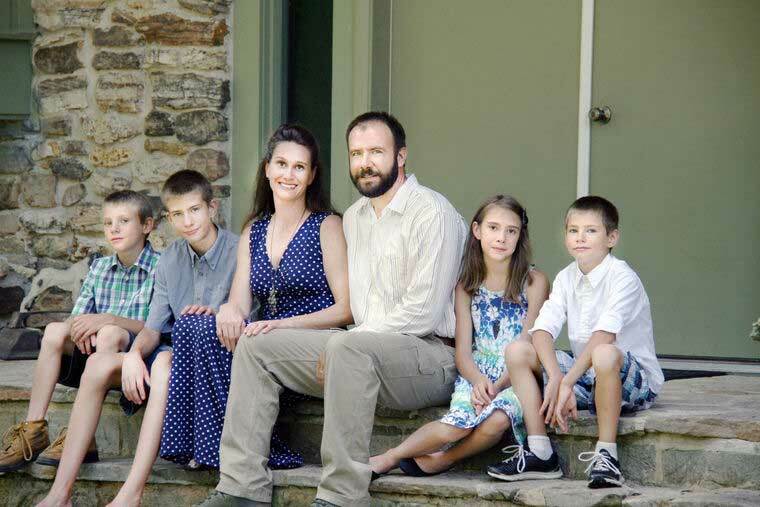 Shelby and Sheree Nold and their children, from left, Cade, 8; Gunnison, 13; Autumn, 10; and Joshua (twin brother of Cade), 8, recently moved from their home near Fair Play into the caretaker’s house next to Rainbow Springs Lodge. They will be assisting the McKees in keeping it maintained and ready for resort guests. 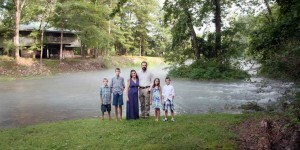 The Nolds operate as caretakers through their Christian-based nonprofit organization, Majestic Outdoors (majesticoutdoors.com). A stone patio is off the first floor, and a deck is on the second floor, both within sight of the spring, which is reached by a sturdy wood foot bridge. Open the bedroom windows at night and the sound of the water tumbling along fills the rooms. The bottom floor of the lodge has a kitchen, utility rooms, half bath and a large open living and dining room with two sets of sofas. The second floor has four spacious bedrooms, each with two single beds and a full bath. The second floor has a balcony looking down on the fireplace and first floor. The balcony was made wide enough to hold extra beds, or sleeping bags. Cots are provided, bringing the maximum occupancy to 14. The nightly rental price, with a two-night minimum, is $850 for up to eight people. Each additional adult is $87.50 a night; children younger than 12 are $43.75. For more information, visit RiverOfLifeFarm.com. Fed by springs and protected by national forest for the top two-thirds of its 50 miles, the North Fork has one of the largest self-sustaining wild rainbow trout populations in the Midwest. Resident bald eagles live in the valley, and the river was chosen by wildlife researchers for a restocking program of endangered Ozark hellbenders, a large, aquatic salamander. The family maintains control of Rainbow Springs and some 1,400 acres of land around it. “Preserving the forests of the watershed ensures protection of the spring’s purity and the North Fork’s incredible scenic beauty,” Carpenter said. Arrowheads and other archaeological evidence indicated the spring was visited by the first Americans. In later days, Jesuits used the lodge for spiritual retreats.